The stainless steel shear beam load cell 3510 is hermetically sealed by welding and is available in capacities from 300 kg to 5000 kg. 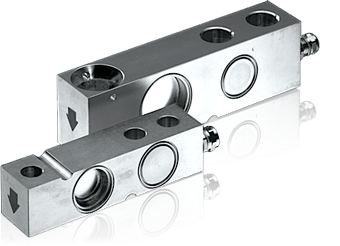 The T end option of this load cell is specifically designed to be used with a range of self aligning feet making them ideally suited to platform applications. The range of feet include height adjustable, flange and food grade options. Typical applications include large platform scales, container, silo and belt weighing as well as force and torque measurements in the test and process industries. Approved to OIML R60 6000D and sealed to IP68, this load cell gives extremely accurate reproducible results, over a long term even in harsh industrial environments. The 3510 shear beam load cell can be supplied with an optional ATEX II 1GD EEx ia IIC T6 certificate for use in hazardous gas and dust areas – Zone 0,1, 2 & Zone 20, 21, 22.